Image: Mosaic detail of Pontius Pilate, Basilica of Sant'Apollinare Nuovo, Ravenna, Italy, 5th-6th cenutry. This is another very brief chapter. Its purpose is to set a time frame for understanding the life and ministry of Jesus. 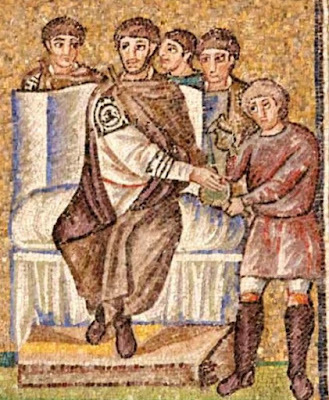 Eusebius begins by referring to Luke as “the historian [ho historikos].” He cites Luke 3:1 with references to the tetrarchies of Philip, the younger Herod, and Lysanius, after the deposal of Archelaus. He then turns to book 18 of Josephus’s Antiquities (note how Luke is set in par with Josephus as an accurate historian of the era) to describe the rule of the Roman governor Pontius Pilate over Judea, beginning in the twelfth year of Tiberius, lasting for ten years. Eusebius rejects as spurious a series of “reports” about the Savior (which Lake identifies as the Acta Pilata, noting they are “Christian forgeries of uncertain date” [n. 1, p. 74]) supposedly from the time of Pilate, noting that they claim Pilate was ruling in the seventh year of Tiberius’s reign, but this cannot be accurate, since, as noted above, Pilate only became governor in the twelfth year of Tiberius’s reign. Again, we see that Eusebius is keen firmly to ground the life of Jesus in historical reality.